This month I traveled back out to Melbourne, Australia, so we could all sit down as a team and go through every aspect of Unsung Story together. I’ve only just returned, and I’m fighting a bit of jetlag, so I apologize in advance if this month’s update is a little unorganized. In case you didn’t see it, be sure to check out our Dev Blog on Animation from this month. Taliesan and Rowan do a great job of walking you our process on character movement. I love watching them breath life into these characters. We’re nearly a year in! There’s so much going on at this point, it’s hard to pick and choose what to talk about while still not spoiling major elements of the game. However, in keeping with the theme of travel, this month I want to finally take our players on a visual walkthrough of our world to see how it has been developing. Welcome to Lasfaria, the location for the 77-year war between the Alionne Kingdom and the Saxtel Empire. It represents 11 months of digging in, hard decisions, and pushing forward to get where we are today. Various names for the world floated around in the documentation we were given like Rasfalia, Razzfaria, and others. But Lasfaria was my favorite, and I felt it was time we finally named this down. Zooming in a little further, we’ll take a look at Branholme and the surrounding country side of the Alionne Kingdom. The Alionne citizens know prosperity and comfort, much of which is built by harnessing the power of a special ore that can absorb and release sound energy. This ore is something that can only be mined in large quantities within their Kingdom. Over the eons of exposure to this raw element, a new race has emerged within Lasfaria, the Singed. The Singed are the third and final playable race in Unsung Story. 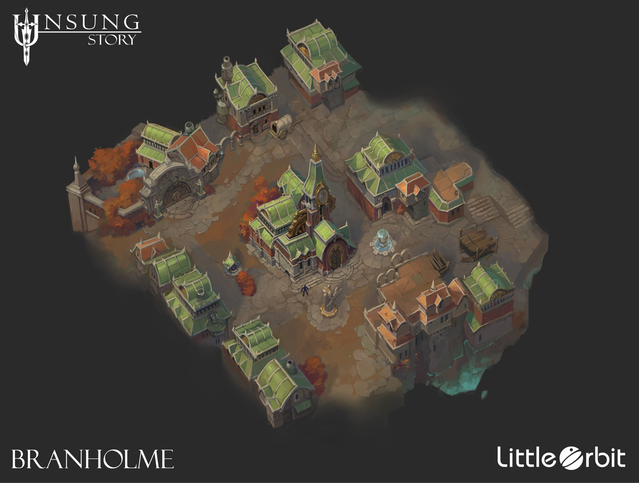 Players will get to control units that are Human, Horned, and Singed through out their adventure. Next I’m going to go over a general progress, then I’ll walk through some UI progress, and I’ll end with some videos of current gameplay in our visual target mission. All 51 missions are now in the game. This is a big milestone for the game, and now begins the long road of building out and perfecting the gameplay of each level. Lots of work refining the narrative. We spent a significant part of June fleshing out cutscenes, character dialog, and story moments. Each mission design had to be reviewed and in many cases modified to make sure it still contained all the elements necessary for the story. “Crescendo Attack” system created. These are the big ultimate attacks that are meant to change the pace of combat and deepen the strategy of the game. Initial AI design created. Currently each unit has the same priority system, but moving forward we’ll be starting to differentiate how the AI plays each class, so they take advantage of their core abilities. Initial Tutorial created. This is a rough pass through the tutorial elements that happen during the first two missions. The goal is to keep tutorialization as light as possible, while the player gets into the game. We expect to learn a lot from our early alpha testers to help us. Significant work on core game flow. This covers critical things such as the order in which abilities are resolved as well as the order in which UI and animations are played and displayed. Added many base animations to the game. These include locomotion (movement between nodes), scaling/climbing, dropping to lower tiles, Disciple Bo-Staff attack (used for all physical attacks currently), Archer basic draw and release (used for all projectile attacks currently), reactionary animations for buffs & debuffs (basic stagger). Basic progression is in the latest build. Players can now save, load, and create new games. In May, our Dev Blog talked about the UI design. That work has continued in June, and we have our first efforts to show stats and game elements. Next month we’ll be working on creating and integrating as many screens as possible to get the core game flow in. Any Tactics game is filled with stats and abilities. It’s the heart of the game. But in Unsung Story, we have the added complexity of equipping two different classes at once – which doubles the amount of important information we need to show. Our job is to surface all this information as cleanly as possible, so players can understand the impact of changes they make. Much of the work above is placeholder. We haven’t yet created the style guide with icons, fonts, colors, and window frames. But this was a big step forward in defining what we need to do. Lastly, let’s take a look at what some of this looks like together. Sometimes early in development, the team will create a single level to try and capture the feel of what we’re building. We call this a “Visual Target”. As is often the case, this level will never be used in the game. It’s purely made up and has no part in the actual story. Many of the art elements in the scene are still placeholders, and not representative of final level art. We’re playing with a lot of things in this scene, however we still don’t have all the classes modeled out yet, so we’ve inserted our Disciple for all the units. You’ll notice he is human with a regular skin tone. Each class can be any of our three races with a number of skin and other variations. The triangle grid is really coming along. The guys have done a great job visualizing this system in a way that feels seamless and less intrusive. We’re using the grid render system as a way to surface lots of useful information like distance ranges and attack areas. Here we some of our Elementalist and Physician skills visualized. And finally a little bit of fun with our Cavalier and his Transfer skill.